If you’ve ever handled fresh or dried chillies, you’ve probably experienced that burning sensation on your fingers and hands at one time or another. 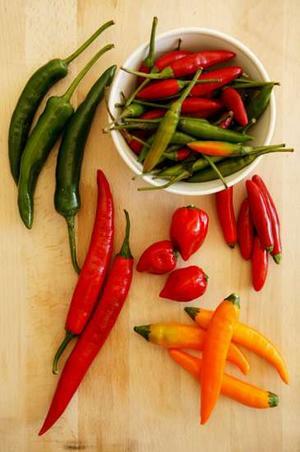 That painful, burning feeling comes from the capsaicin in chilies and chili peppers like jalapeños. You’ve also probably found out that washing your hands in soap and water – however long you do it – didn’t relieve the burn. Here are some tips on how to get rid of chili burn. 1) Try dabbing some lemon or lime juice (vinegar will work too) on the affected areas. Why this works: The acid in lemon/lime juice or vinegar counteracts the alkaline in the chili’s capsaicin. This also explains why you only get chili burn from handling fresh or dried chilies and not chili sauces (because most chili sauces already has some acidic content in it, like lemon juice or vinegar). 2) Rub some oil (e.g. olive oil, coconut oil, etc) over your hands after cutting the chilies. Then wash off with soap and water. Why this works: Capsaicin is oil-soluble, so rubbing oil over it loosens the compound. 3) Run your hands through your hair. A commenter (AL) shared that running your hands through your hair can work to soothe the burning sensation. Other commenters (Rivrey & sherods) have also confirmed that this works! Why this works: The only thing I can think of is that this has something to do with static electricity and a transfer of the positive/negative charge between hair and chili-burned fingers. Why this works: The waterproof barrier prevents the chili from ever touching your skin. Remember not to touch your eyes or face while wearing the gloves. Throw them away after use. Dab a bit of soap and water over a foggy bathroom mirror. Wipe the excess suds with your fingers and voila, No More Fog! Your mirror's fog-free status will last about a week with this simple tip. You’re very welcome and good luck on your science project! thanks so much for this information. i have searched on many other sites and they also give me the same response that lemon/lime juice cures it. This has helped me alot in my science assignment. Thanks. Your hot water advice just saved my fingers! I tried all.. And hot water is the best! milk is actually the best because of the fat and calcium so the best thing to do is drink full cream milk. visit my web site which will be finished soon when it is i will put the address here. Vinegar works too if there’re no lemons. I dab apple cider on my affected arears and have it soaked for a while. But don’t use soap anytime soon, it makes the burn a hell lot worse. Try vicks vapor rub. I tried everything didnt work. finally tried vicks, was able to sleep very well. Did the lime thing, then used a Hemp Hand Protector for dry skin from Body Shop and 95% of the burning was gone. Interesting… thanks for sharing Rasif! Apparently, Vicks Vapour Rub makes it sting like HELL! vicks makes it far worse!!! do not use it, please! really hot water works well, doesnt go completly but the majority has calmed doen! tried lime juice, then vinegar but didn’t work. The olive oil did though – thanks! I tried salt which worked a bit but seemed to spread it around?? Then milk, which soothed it while the milk was in contact, then lime juice which helped a lot, and finally olive oil (last three all on cotton balls) and relief at last! I tried limes which worked for like 2 minutes.. Then it struck me! Baileys did the trick.. The perfect combination of cream/ milk and alcohol! vicks really dosent work and neither does oil..
my wife had this issue today, She tried all the suggested remedies, from baking soda, alcohol. milk. calamine lotion, and ice, and experiencing this agony since noontime . Out of desperation, she was just brushing up her hair with her both hands just to soothe the pain, she noticed the slowly diminishing, until she total felt no more burning pain in couple of hours. I can’t believed it works, but it did. Try it , Give us some feedback if it works for you. Gook luck ! hi the olive oil and lemon juice rubbed into hands worked, alongside a glass of milk to drink. I tried both but it didn’t work for me. thanks guys,vinegar is the best remedy to remove the chili burn.i cut chili and i forgot to wash and i touch to my face………i dont know how to explain..but vinegar remove the burn almost 30 minutes. I was roasting and peeling HOT green peppers today. My hands were burning to the point that I was soaking th ice water on this really cold day! I rubbed vegetable oil and salt into my hands. It worked for awhile. Now I have been running my hands and fingers down and through my hair. It’s actually working! Thanks for sharing, that’s pretty interesting that it worked! Crack a raw egg over the burn and hold the contents of the egg for about a minute. You should feel better. Thanks samatha for your sharing, vinegar works best for me, l have been suffering from the burning sensation since last night till this morning l try your remedy, it works immediately! You’re welcome, I’m glad to hear that vinegar worked! the hair thing definitely works! Had horrible experience after handling chillies. Tried all the recommended remedies n nothing worked. My hands felt as tho they were burning. No amount of ice or water or nail plush removal etc did any good. I even tried the lemon juice. Tried rubbing sandal wood powder as suggested in olden Indian Aayurveda. I rubbed a creme which had urea n lactic acid on my hands. Over it I rubbed common table salt. I applied a little bit of water to moisten the salt. Left it to dry a bit and then dipped my hands in a plate with cold water. This has worked like magic. Plz try this. We may try yogurt or dahi as it has lactic acid in it. p.s: Fyi, the ingredients list for the cream that Manisha used (Compeed) looks like Aqua, Urea, Lactic Acid, EthylHexyl Palmitate, Isopropyl Palmitate, Stearyl Alcohol, Glyceryl Stearate, Sorbitol, Ceteareth-25, Ceteareth-6, Palmitic Acid, Stearic Acid, Parfum. Hello!can u plz tel allopathic drugs which r used as burning hot chillies? After getting the oil in my eyes and nose plus all over face and hands I found scrubbing with milk, then where possible applying toothpaste or rinsing with toothpaste solution. It does hurt eyes/nose but when rinsed with water it takes the chili burn too. I would have though all the available hydrogen in acids would cause the capsicain to react more strongly, meaning a more intense burning though. Hope one of the solutions above worked for you at least. As an aside, let me know if you want me to remove your mobile number there. The hands in the hair suggestion worked right away!!!!! Awesome and thank you! Dish Soap – If it can cut through oil and grease on our dishes, it can do the same for our hands! Most dish soaps have oil-dissolving properties that are above and beyond regular hand soap. You need not need any of the oil n etc stuffs just go into your kitchen and grab that dish wash liquid. O’Keefe’s Working Hands cream in the green tub. Almost immediate relief when applied thickly. Does contain Urea like other posts have recommended.